To explore the definition and purpose of modesty and privacy by visibly displaying the physiological signals projected by our skin, while still adhering to social acceptability in both modesty and fashion. Inspiration: See my previous post. A blush (face region) or flush (the rest of the body) is the slight to sever reddening of the skin which occurs due to blood vessels near the skin dilating, allowing more blood to come to the surface of the body and therefore more heat to radiate form the body. The causes of blushing and flushing are varied, but can often be due to involuntary reactions For example, people blush and flush when they are sexually aroused, angry, or embarrassed. Though involuntary, these bodily signals do seem to be direct, purposeful responses meant to communicate with those around us. For example, studies have shown that children do not start blushing until they are about school age, when they start interacting in social situations. Additionally, Dr. Peter D. Drummond has done studies that demonstrate that people blush more on the side of the body that other people can see. Most interesting are studies that show people who blush are better liked and accepted. It seems that, contrary to what you might think, showing your inner emotions is a good thing. Whether it’s warning those around you that you are angry or displaying that you know you did wrong and feel bad about it. Though it is hard to replicate these slight skin color changes on cloth, the high correlation between deeper blushing (more red) and higher heat – both results of increased blood flow – mean that mood rings aren’t that far off. Mood rings are made of thermochromic liquid crystals that reflect different colors at different temperatures. 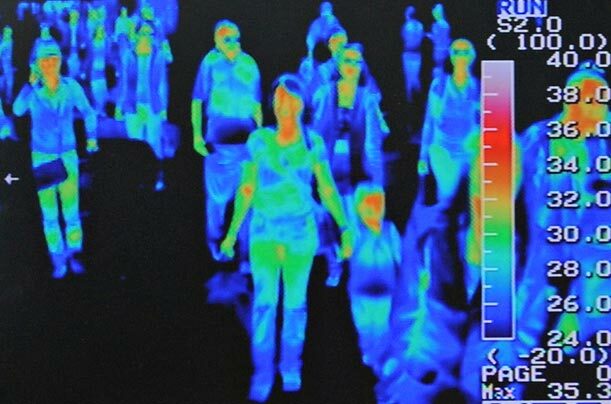 Though it is hard to map a specific mood to a specific temperature (color), material that changes color due to more blood flow (higher temperature) acts very similarly to how skin changes color due to more blood flow. Though crude, creating “mood clothing” is a low tech, time conserving and cost saving way to try to display the skin’s signals on the cloth that covers the skin. Once a re asonable method was determined (thermochromic liquid crystals), the next step was to find liquid crystals and an adequate clothing item to apply them to. Since the goal of this project was to maintain modesty, while still being somewhat fashionable, clothing that was decently concealing was needed. 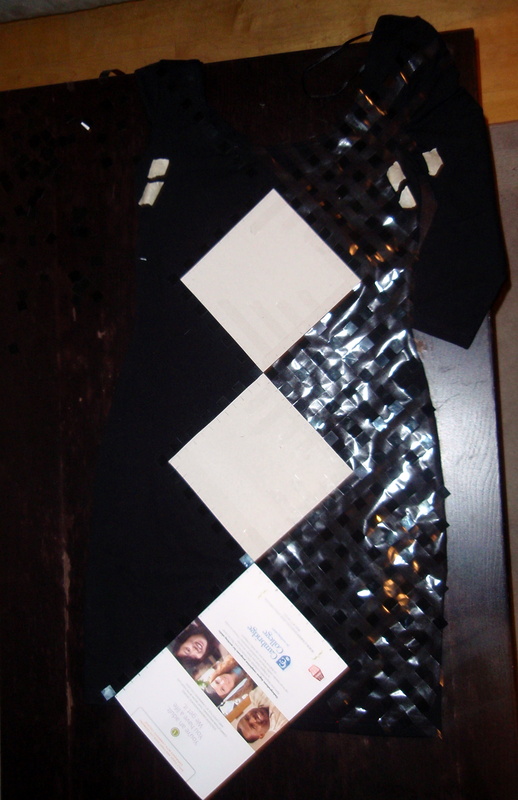 At the same time, it had to be tight enough to allow sufficient heat transfer between the skin and the clothing. 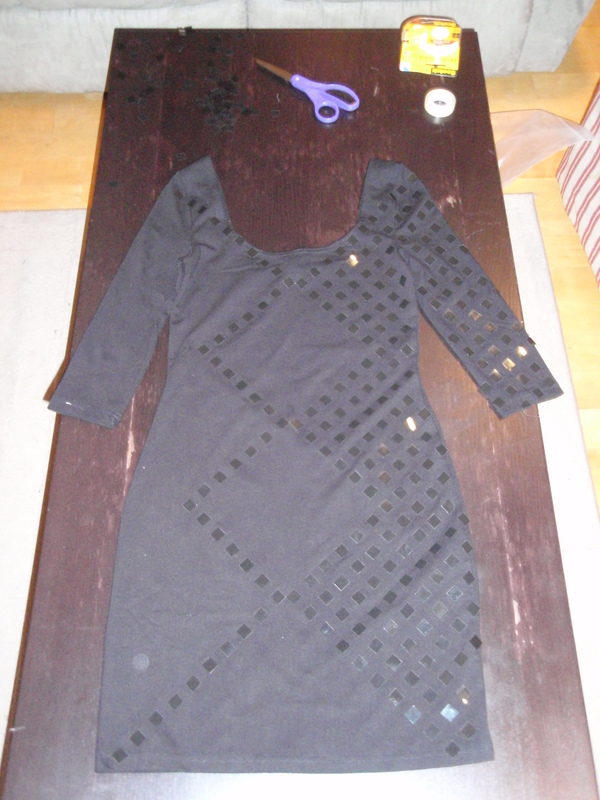 For these reasons, a form-fitting black dress of moderate length and long sleeves was chosen. A longer dress could not have been form fitting around the legs and still allowed movement, while an all black body suit would not have been very fashionable. Additonally, the design of the applied liquid crystals needed to be fashionable, but also tasteful. Covering the dress in luqid crystals would be tacky and too revealing. 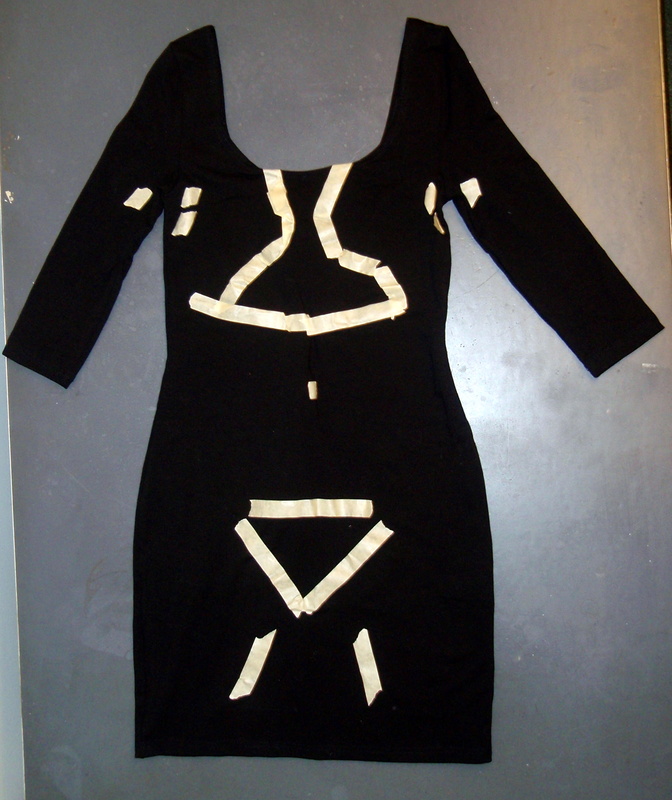 A design was chosen to conveniently leave areas with limited skin contact, like cleavage, belly button and groin areas. First, the dress was marked with the areas to avoid, then the luqid crystal sheets were cut to size and applied with double sided tape. I used a template and created a grid using tape to help keep the pattern aligned. After placing all the squares of liquid crystals, I removed the templates and grid. Taping off areas to avoid. 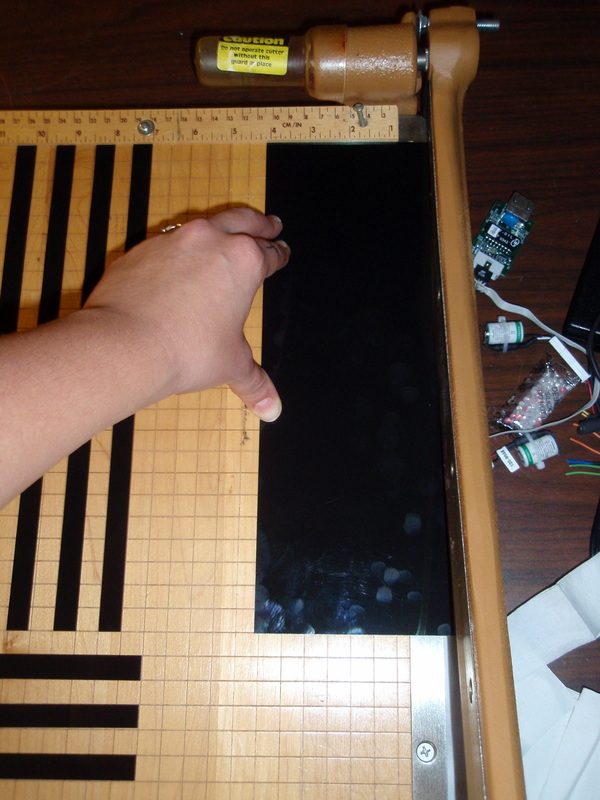 Cutting the liquid crystal sheets into 1/2" strips. Laying out the templates and grid. Note that they can be designed for various temperature ranges. Since this project was looking at the skin temperature in the core of the body, liquid crystals active over 30-35°C were selected. If you are looking for liquid crystals to be active by touching them with your hands, a range of 25-30°C may be more appropriate. Also, since a dynamic color range was desired, liquid crystals were chosen. If you only desire a single color change at a specific temperature, thermochromic ink can be used instead. This is how hypercolor (http://en.wikipedia.org/wiki/Hypercolor ) t-shirts work. Results: And here it is! Check out Brooke’s blog for her experience wearing the dress for a day. I read an interesting article by Mark Changizi (the author of a new book about our understanding of vision, The Vision Revolution) that explained his theory that humans’ unique color vision evolved so that we could better read the physiological signals our body produced. He posits that the reason humans do not have hair all over our bodies in the way that other primates do is that we use our entire body to “signal” – blushing, anger, arousal, fear, etc. What I found interesting about this is that over time, modesty and society caused people to cover up the exact skin that we evolved hairlessness and color vision to see, at least according to Mr. Changizi. This made me think about how we could *use* clothing to project the physiological signals that our skin sends, while still bowing to social (and practical!) issues of modesty and protection? Imagine clothing that mimicked the body’s reactions underneath it: goosebumps, blushes, flushes… Not the static imperfections – no sunburn, or freckles or pimples or moles or unshaved legs – only the dynamic ‘body language’ that happens when our body reactions to emotional states. By more prominently displaying this relevant information which is usually more subtle (and often hidden entirely! ), the wearer (and on-looker!) is forced to re-evaluate the definition and goal of modesty. Is it the skin itself that is so tantalizing? Or the messages it sends? The garment also brings up issues of privacy intrusion. When people cover their bodies, is it the shape (cologne, dimples, and fat, oh no! ), base skin tone (no time to fake tan this week…), and flaws (no time to shave, annoying mole, acne break out, etc) that they want to hide, or is our fear of mind reading in the wake of Minority Report another reason we choose to conceal our skin? Would humans be more empathetic if it was easier to discern the emotional state of those around them? Would we learn how to better control our emotions if they were on constant display? Or would manipulation and exploitation be made that much easier? Would the thrill of the chase be removed if you could read your love-interest’s emotional state and know (maybe before they consciously did!) that he or she was attracted to you? Now, think if this piece of clothing, that projects underlying skin signals, was a burka. Inspiration for the practical application. 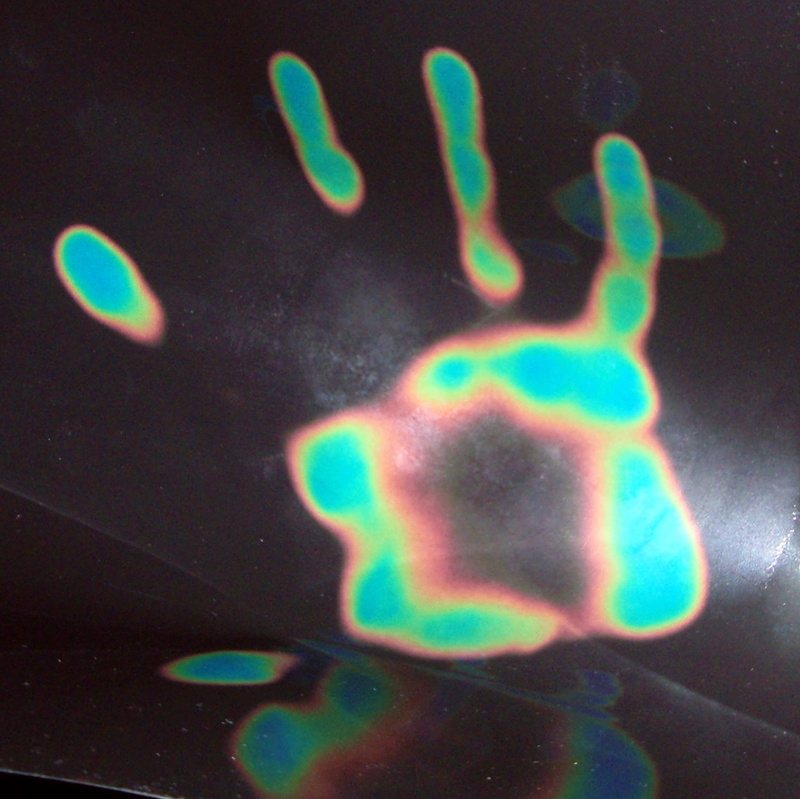 I think this could be accomplished using thermochromatic liquid crystals (think: mood rings), which, while not exactly mimicking the skin’s subtle color changes due to blood physiology (oxygenation and concentration), do change color due to a person’s skin temperature, which is closely related to blood concentration. Though a burka is sadly too lose to do this well, a tight fitting, realtively modest black dress would work. That way it can be fashionable, still maintain goals of modesty, yet allow skin temperature monitoring by liquid crystals on the dress.